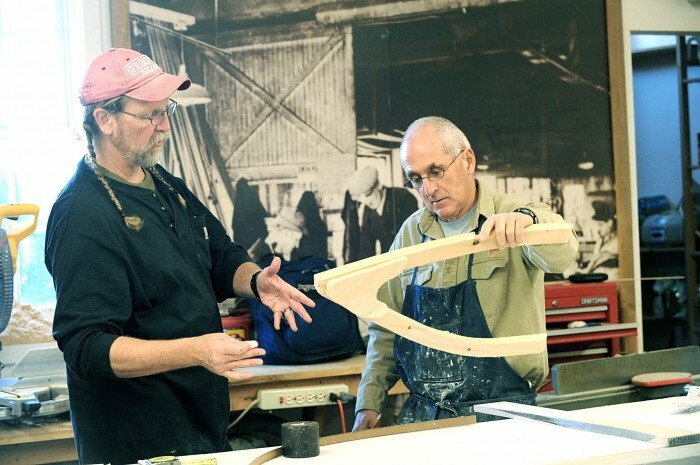 TUCKERTON — Ron Spodofora spends his days building sneakboxes inside Perrine’s Boatworks at the Tuckerton Seaport. Spodofora, 63, of Stafford Township, built and maintained roller coasters at Six Flags amusement parks for 33 years. Since his retirement, he works in the wood shop dressed in a paint-spattered apron. Spodofora has been building the boats for the past three years. He said he built sneakboxes as a child with his father. 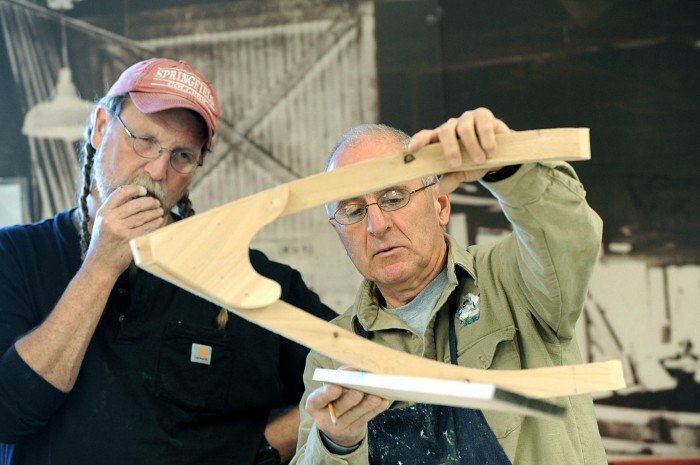 Each weekend during February, Spodofora led sneakbox building classes at the Tuckerton Seaport. “It’s really important for the traditional arts that it’s passed down in the community. But Ron grew up around this and learned from Gus Heinrichs before he passed away in 2009,” said Jaclyn Stewart, director of the Jersey Shore Folklife Center at the Tuckerton Seaport. Heinrichs was the seaport’s former master builder. “I learned a lot from him,” Spodofora said. Inside the shop, on top of a carpet of wood shavings, sit two Barnegat Bay sneakboxes. The wooden, elliptical boats are smooth and ready for painting. The lumber used for sneakboxes comes from Atlantic white cedar logs. “Each sneakbox takes eight logs, 12 inches in diameter and 13 feet long,” he said. The boats are painted with an oil-based paint, and no fiberglass is used, he said. “In the beginning, you start with a bunch of pencil lines and you end up with this,” Spodofora said as he laid his hands on one of the boats. He said a sneakbox is unlike the average boat, the hull of which is like a farmer’s plow pushing through the water. “The hull on the sneakbox boat is comparable to a spoon. It allows the boat to glide across the water with no sound, as if it’s sneaking up on something,” he said.